Categories: Red - Cabernet Sauvignon, Red - Syrah and Petite Sirah, Unique Reds. Piocho Ranch was acquired by Thomas J. Barrack Jr. in 1992. Out of a love for the countryside and a ranchers life, the Barrack family developed rolling acres of vineyards. The peaceful and beautiful property sits nestled in the Happy Canyon Valley, a perfect location for growing grapes and riding horses. Two regulation sized Polo fields are groomed with the same care as the finest golf courses in the world. Piocho means “Where the two rivers meet and go to heaven.” The Happy Canyon Piocho 2015, a Bordeaux blend, has an inviting deep ruby color. Ripe black currant, cherry, espresso and smoky oak show on the nose. This wine is lush, sweet and open-knit, with a pliancy to its flavors of dark berries, licorice and chewing tobacco. The Happy Canyon Bordeaux Red Blend 2015 exhibits deep aromas of spice, dark bing cherries, wood, burnt blackberries and jam. On the palate there are slight herbal/floral flavors with minerality, dried violets and tobacco all surrounded by dense fruit. This a truly lovely wine that is wonderful to drink today when paired with big rich cuisine such as Santa Maria Tri-Tip. The wines structure will allow it to mature and age nicely for at least another decade! Dusty, slow-building tannins give grip to the finish, which repeats the cherry and licorice notes. This wine is a blend of seven prestigious vineyard sites representing four unique soil types in the Walla Walla Valley. Its old world structure, dense dark fruit flavors and elegant tannins exemplify the best of Walla Walla. 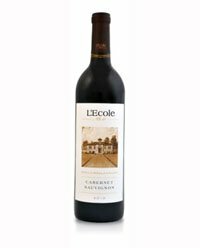 With an elegant, old world structure, this sophisticated Cabernet shows aromas of dark fruit, earth, and fresh herbs. A seamless core of blackberry, plum, and dark cherry mingle with notes of tobacco and leather on a dusty tannin, richly structured finish. Canine Companions for Independence is a non-profit organization that enhances the lives of people with disabilities by providing highly trained assistance dogs and ongoing support to ensure quality partnerships. Their beautiful label, featuring one of their puppies in training, is paired with an outstanding 2015 Sonoma County Cabernet Sauvignon selected from Mutt Lynch’s best barrels. Bold aromas and flavors of red plum, black cherry and violets, with hints of dark chocolate.